June 14, 2016 | By admin | Comments Off on A Kapela | Filed in: Grupa Grmeč Božo i Repa. June 14, 2016 | By admin | Comments Off on Oštra Luka | Filed in: Grupa Grmeč Božo i Repa. June 14, 2016 | By admin | Comments Off on Okanova Bukva | Filed in: Grupa Grmeč Božo i Repa. June 14, 2016 | By admin | Comments Off on Republika Srpska | Filed in: Grupa Grmeč Božo i Repa. June 14, 2016 | By admin | Comments Off on Sanjanka | Filed in: Grupa Grmeč Božo i Repa. June 14, 2016 | By admin | Comments Off on Nek podigne ruku | Filed in: Grupa Grmeč Božo i Repa. June 14, 2016 | By admin | Comments Off on Parfemi | Filed in: Grupa Grmeč Božo i Repa. June 14, 2016 | By admin | Comments Off on Branko Ćopić | Filed in: Grupa Grmeč Božo i Repa. 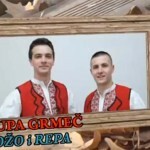 June 14, 2016 | By admin | Comments Off on Duet sa Bajom Malim Knindžom | Filed in: Grupa Grmeč Božo i Repa. April 18, 2016 | By admin | Comments Off on 90% | Filed in: Grupa Grmeč Božo i Repa.